Many of us use the Borrow Direct service to get materials not available at Columbia University Libraries, but do you know about the Borrow Direct Plus On-Site Borrowing program? Through the Borrow Direct Plus On-Site Borrowing program, current Columbia, Barnard, Teachers College, and Union Theological Seminary faculty, staff, and students also have on-site library borrowing privileges at Borrow Direct libraries: Brown, University of Chicago, Cornell, Dartmouth, Duke, Harvard, Johns Hopkins, MIT, University of Pennsylvania, Stanford, and Yale. Review the hours, access information, and policies for an institution prior to your visit: Borrow Direct Plus On-Site Borrowing. 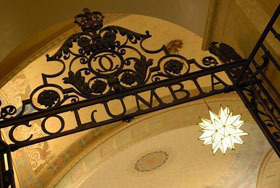 When visiting one of these libraries, just show your Columbia ID. You’ll be asked to log into your Borrow Direct account to verify your eligibility. Once verified, you’ll get your library borrowing card. The next time you visit one of these universities, visit its libraries and check out what you can borrow! This entry was posted in News on October 4, 2016 by Francie.